Baby Jogger VUE Strollers - FREE Shipping! 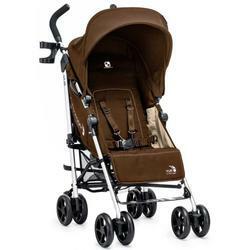 The Vue our revolutionary reversible umbrella stroller. Sometimes your child wants to see the world, sometimes they want to see the person who is their world. With the Vue they can see both. An evolution in umbrella strollers, the Vue can switch from parent facing to forward facing in an instant. The Vue is not intended for jogging. Welcome to the Fold™ - Just press your foot up then down on the release levers and the Vue folds down in a snap. The carrying handle makes lifting and carrying your folded stroller a breeze. Reversible Seat - Parent facing or forward facing, you can stroll both ways! The seat of the Vue reverses direction in a simple one-hand motion. Face your child toward you to keep an eye on each other when they are little, then flip the seat forward so they can explore the world as they get bigger. Canopy - Our UV 50+ multi-position canopy will throw a lot of shade on a sunny day. It reverses in one easy step to protect baby from the sun’s rays while facing you or facing the world. Seat - This offers multiple recline positions in either direction and comes with a removable padded neck support to make sure that your child is comfortable. With a 55 lb. weight capacity and multi-position footwell on both sides, your little one will be good to go. Wheels - You can set your 5.5” lightweight front wheels to swivel for your daily obstacle course or lock for long distance strolling. Travel System - The Vue can become a travel system in a heartbeat using a Car Seat Adapter. Simply snap on the brackets and youve got a customized travel system for your infant. You can also add a soft pram for all season comfort to handle even the littlest of passengers. (Car seat, car seat adapter and Soft Pram sold separately). Dimensions Unfolded: 33" x 20.25" x 42"
Dimensions Folded: 42.25" x 11.5" x 13.25"